Back after finishing his scholarship at Oscar Award winning musician A R Rahman's Music Academy in Chennai things have been looking up for Dinesh Subasinghe. The talented musician has been selected by Grammy award winning artiste Joel Thomas Zimmerman’s Orchestra Of Our Time to record his string quartet in New York! Dinesh’s score had been selected from over 100s of compositions from all over the world. He has been selected to publish his music on a USA based Internet radio show coordinate by Tina Rayan from the Yanni Videography Team this month. 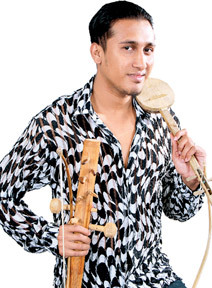 For more than 17 years Dinesh had been known for his musical talents. Now he is ready to proved his versatility in the field by venturing into acting in Lohitha Rajapaksa’s movie 'Ravange Puthu' where he will perform the role of Ravan’s alien musician. Though his career has taken a new turn Dinesh has not let gone his passion for music. He had composed music for seven local movies and has been approached to set music to another three upcoming movie by Channa Perera, Lohitha Rajapaksha and Shaan Perera. 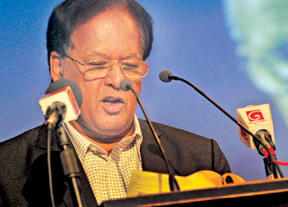 Not sticking to the wide screen Dinesh has also gifted his tunes to 39 teledramas, 14 stage plays, five documentaries, 10 musical television and radio series. He has also been kept busy with completing four solo CD albums. His second movie music direction ‘Sihinaya Dige Enna’ hit theatres recently. Directed by director Chandrathna Mapitigama ‘Sihinaya Dige Enna’ is the first movie in which movie buffs will hear Dinesh’s heartwarming tunes. The movie is the maiden production of Samantha Ranasinghe on behalf of Sandaru Films. ‘Sihinaya Dige Enna’ embodies a music filled theme in which the heroine Udari Warnakulasuriya takes on the role of a violinist. 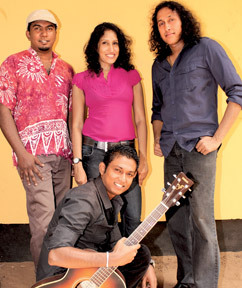 Popular actor Amila Abesekara plays the character of a guitarist. Though the story is basically a romance, it also focuses on the ethnic issues of Sri Lanka. It spreads the message of love and peace among individuals. Filmed in Bandarawela the scenes comprise some eye catching landscapes on the lush countryside. “The film has three original songs followed by a remix in Tamil. The Sarasavi Studio Chief Sound Editor said that the soundtrack is phenomenally and breathtakingly romantic. The smooth beats and hypnotic vocals are second to none, and very few soundtracks are as complete as this one,” Dinesh recalled the exact words uttered by the artiste. He also performed a pivotal role for this movie with his music by bringing dynamic orchestrations and touching lovable melodies. “At times the music tends to be simple and carefree and in the next instance it changes into a romantic tune which works on you heartstrings. There are times it turns rough and eerie so that your heartbeat quickens in phase. I believe that the theme song is especially catchy and it will become a hit with the audience,” Dinesh opined. His association with the director in the movie comes after having worked with him in 12 teledramas, three movies and one documentary. “Udari was a great fan of my ex band Dee R Cee. She had a great interest in the violin and was able to mime the scenes where she plays the violin with perfection. It was no problem setting the scenes into music with her moves. I was very tough on her because I needed to make sure she performed as a skilled musician but in the end of the day all our hard work paid off. We all had a wonderful time working on the project,” he said. Speaking about the memorable moments of ‘Sihinaya Dige Enna’ Dinesh says that the team comprising of seasoned artiste Sanath Gunatileke, Udari, Amila, Pin Pong, Veena Jayakody and others used to sing all night and start work in the morning. “The weather was awesome and the team spirit fantastic. This is the first movie recording I did after launching my music studio Digital Line with Ranushka Fernando in Negombo,” he noted. Dumal Warnakulasuriya of Sirasa Superstar fame entered the movie playback singing through ‘Sihinaya Dige Enna’. Another newbie Kasun Primal too sang in the movie in which Uresha Ravihari rendered her voice for the songs. Some of the violin orchestra music was recorded in India. This came about with Dinesh’s connection to Rahman. Voicing his thoughts about the musical aspects of the Sri Lankan cinema, the gifted youth said that he believes that movie music can embody international appeal. He says, “We are a politically developing country but we have already excelled in music. The only drawback to the situation is that we are disorganized. I have tried my best to bring sounds similar to those found in quality Hollywood and Bollywood movies into the film. The support from Symphony Orchestra members and Indian musicians are greatly appreciated because they made things easy for me. I convert my emotions to the music and then we work hard to breath life into it. Recently the fans have started a standard Wikipedia page for Dinesh. It came as a surprise after working with the Yanni Videography Team in a few of their projects and next thing he knew international music fans who have met him in India have penned about Dinesh’s Buddhist oratorio and his voyage with the Ravanahatha on Internet! Dinesh was the Guest of Honour at St Peters College, Colombo’s Art Festival recently. It was a specially touching moment in his life as he was honored by the students and staff of his alma mater. “I am grateful to Rev Father Trevis and Asiri and Sanantha Amarajewa sirs and all the other staff members for giving me the opportunity. It holds a special place in my heart,” he said. Dinesh is currently composing music to Minister Reginauld Corray's maiden teledrama directed by Joseph Jerome. He is also involved with Cletus Mendis’ movie ‘Parapura’. He is also working on a few teledramas for Plus One Production House - ‘Surangana’ and ‘Sansara Sakmana’. thinker and cinematic genius who first introduced the concept of naturalistic acting taking the camera out. 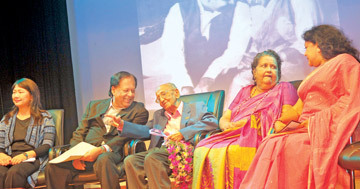 92 years of age he has rendered an indelible service to Sinhala Cinema. Speaking at the second annual Lester James Peries Oration, the Chief Guest Senior Minister of International Monetary Co-operation Dr. Sarath Amunugama called Lester James Peries a close and affectionate friend of over half a century and said he was grateful to the organizers of the event for allowing him to pay tribute to Lester James Peries. 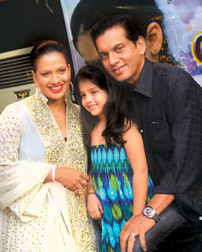 “Lester James Peries has dominated Sinhala Cinema. He is one of the few remaining cultural icons of the country and he is a giant of world cinema. Thank you Lester and our best wishes go to you. Since our friendship goes back a long time I would like to begin with the reminiscence of an early meeting with Lester. He had invited me to visit Balapitiya where he was shooting scenes from Gamperaliya. In those days film crews were on location for long periods and at a time for much fellowship and special visits from friends, particularly from the producer who turned up from time to time to pay the bills and make sure that the Director and the technical crew did not pave the way for bankruptcy. “ Wickremesinghe expressed his view that cinema cannot do justice through literary works. Probably based on his experience in South Indian Films which was then the main cinematic offerings for the Sinhala audience. Amunugama recalls that they were invited on that day probably because a key scene was being shot in Balapitiya It was the marriage scene of Nanda and Piyal. We crowded around the verandah of the walawwa, out stepped the wedding couple, and I immediately remember Lester deploying his new actors on stage such as Tony Ranasinghe to give a sense of the festive occasion. There were also many foreigners in the crowd to suggest that Piyal was giving his fortunes in Colombo. Crackers went off and confetti flew down on the couple. “I have also had the pleasure of seeing all his films from the documentaries he has made to his latest films. If you look at the body of work of Lester what stands out is his humanism. Humanism has been defined as any system mode of thought or action in which human interests, values and dignity predominates. It had a strong influence on Lester James Peries. While he progressively delved into Sinhala society, he was also a cosmopolitan. Whatever our nationalist thinkers say almost all the distinguished creative artists and literary figures of Sri Lanka have been largely influenced by their readings of the great works of Western Literature”. Seasoned film producer Sunil T Fernando launched his 54th film production ‘Doni’ recently. The movie sees Sangeetha Weeraratne and Kamal Addaraarachchi back in movies after a considerable stint. Sanath Gunathilake and 20 children will star in the movie which embodies a children‘s theme. V Sivadasan will direct the film. The HD film equipment will be provided by Rohan Weliwita of Fine Vision. Meanwhile the producer and director’s latest movie 'Daruwane’ is set to hit the wide screen soon. It is also based on a child friendly story and features a number of popular artistes such as Jayalath Manoratne, Duleeka Marapana, Janaka Kumbukage, Nadeeka Gunasekara, Vishvanath Kodikara, Thisuri Yuwanika, Shayan Perera, Wijeratne Warakagoda, Yohan Perera, Kokila Pawan, Thrishuna Perera, Rachini Viranga, Palitha Silva, Chanaka Madushan and others.